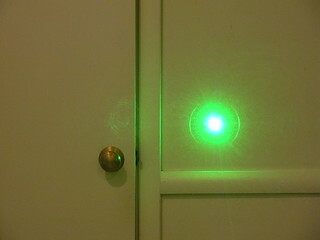 This is the dot projected by the Wicked Lasers "Spyder I Pro" laser at about 2.5 meters from the aperture. It's extremely bright. Update: I have replaced the original photo; this new version corrects some distortion problems and shows the projected dot more clearly.